Buying a coop in NYC takes around 3 months from the time you sign a purchase contract on an apartment. Co-op buyer closing costs are between 1% to 2%, which are much lower than the typical ~4% for condo apartments. You can estimate your buyer closing costs using this calculator. Most co-ops will require you to meet strict financial requirements which may include a debt-to-income ratio (DTI) between 25% and 30% as well as post-closing liquidity of one to two years. Co-op apartments in NYC generally have restrictions on how often you can sublet, and they typically charge owners a subletting fee. Buying a coop in NYC can be a daunting process. Not only will you have to understand the nature of co-op versus condo ownership, you’ll have to complete a lengthy board application plus pass a potentially grueling coop board interview before you can close. 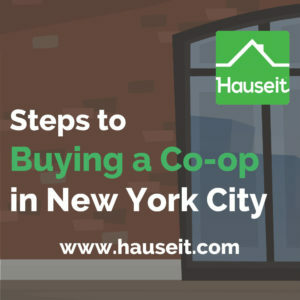 We explain each step of the co-op buying process in NYC in the sections below. Learning the insider tips and tricks for buying a coop apartment in NYC will maximize your chances of success. Is Buying a Coop in NYC a Good Idea? What Happens After Your Offer Is Accepted in NYC? What Happens After Your Deal Is in Contract in NYC? There are significantly more co-ops than condos in NYC. Greater supply equates to lower prices, all else equal. Co-ops are not generally purchased by investors and foreign buyers due to subletting restrictions which makes them harder to rent. Less demand equates to lower prices, all else equal. Buying a co-op instead of a condo is also a good idea when it comes to your buyer closing costs. Buyer closing costs for co-ops (1% to 2%) are less than half of what you’d pay for a comparably priced condo (around 4%). If you’re buying a $1,000,000 apartment, saving 2% on your buyer closing costs can equate to an extra $20,000 in your pocket at closing. Often times, buying a coop in NYC is the only way working families can afford a larger apartment when it’s time to have kids. Many buyers simply need more space for their budget than what a condo will offer. Unlike condominium apartment owners, co-operative apartment owners are technically shareholders of a corporation that owns the entire apartment building. Co-op apartment shareholders are given a proprietary lease that lets them reside in the apartment that they purchased. However, because they don’t technically own the apartment that they dwell in, they are not considered to have real property rights. The cooperative corporation is run by a board of directors that is elected by the shareholder base, similar to what you’d see in a regular business corporation. Buying a co-op can be a bad idea due to the fact that the board of directors enforces strict rules and regulations that touch every aspect of life within a cooperative building. These rules can hamper your ability to sublet the apartment and impact whether or not you can renovate your apartment before selling. Coop boards typically exercise dictatorial power versus comparable condo boards, though these days there are many stories of condo boards who think they are coop boards in terms of power overreach. What’s arguably the worst thing about owning a co-op is that the co-op board can derail your future sale by rejecting your buyer, in some cases multiple times. Furthermore, many co-ops charge sellers an extra closing cost called a flip tax. This unique form of living in New York City is confusing and not attractive to most foreign buyers and investors who do not want to be forced to reside in a coop once they purchase and want to be able to rent out or sublease an apartment when they please. As a result of this reduced investor and foreign demand, combined with the fact that co-ops have historically made up three quarters of the apartment housing stock, buying a coop has always been more affordable for local New Yorkers than buying a condo or buying a house in NYC. In summary, buying a coop in NYC is a good idea if you have a limited budget and need more space. For most working New York families who do not want to deal with hour long commutes by moving out of the city, buying a coop is a very attractive alternative primarily because of the reduced cost of co ops vs condos. Furthermore, the typical co-op subletting restrictions don’t have any effect on a buyer who has no plans to leave NYC. Note: As an additional benefit, buyers won’t have to pay the Mortgage Recording Tax when they purchase a co-op apartment in NYC. This is usually one of the largest NYC closing costs that buyers have to face when buying real property like condos or townhouses. The very first thing you should do before you begin your apartment search in earnest to do thorough research on everything related to buying an apartment in NYC. That means thoroughly understanding what closing costs in NYC are so you know if you have enough liquid assets to close plus satisfy a co-op’s post-closing financial requirements. It’s also a good idea to thoroughly educate yourself on the topic of condo vs. co-op in NYC so you know exactly what tradeoffs you’re making by going for a co-op instead of a condo. You should also get a thorough understanding of all the NYC real estate taxes you’ll face when buying, owning and selling an apartment in New York City. Furthermore, you should learn what the most common first time home buyer mistakes are in NYC so you can learn from the experience of others who came before. You should also study apartment viewing tips and good questions to ask during a showing before you schedule your first appointment. Be prepared before you attend your first apartment showing by studying our list of the best questions to ask when viewing an apartment to buy in NYC. Most importantly, you should research the role of buyer’s agents and how you can save money on your purchase through a buyer’s agent rebate. You should then do some research and thinking about the power of discretion and reputation when you decide to work with a buyer’s agent who is providing you with a rebate. Just remember, a rebate won’t do you much good if the seller and listing agent will automatically find out about it. After all, what’s the point of saving money at closing if it alters how a listing agent and seller negotiates with you and possibly results in the seller showing less flexibility on the sale price or feeling resentful and selling to a different buyer altogether? You’ll want to work with a buyer’s agent who has discreetly agreed to provide you with a rebate. Furthermore, this agent should be a traditional buyer’s agent who does not openly discount and has good working relationships with the wider brokerage community. Because NYC real estate is a two agent model which requires the cooperation of agents, it’s essential that your buyer’s agent is non-disruptive and has a good reputation with fellow agents. Hauseit provides complimentary introductions to the city’s finest real estate brokers who have discreetly agreed to provide you with a commission rebate. Through Hauseit, you’ll be able to work with a seasoned, brand name buyer’s broker who will not only provide you with great service and expert advice, but also a discreet commission rebate gift at close. No one will know you are getting a better deal. It’ll be our little secret! Once you’ve committed to buying a co-op apartment in NYC, done research on the apartment buying process, and have been introduced to a veteran buyer’s broker who has agreed to discreetly provide you with a commission rebate, then it’s time for you to find the perfect apartment to call home. Out of respect for your buyer’s broker’s time, you may consider attending open houses on your own until you get a sense of what you like and don’t like. Most buyer’s agents are busy running open houses for their own listings on Sunday, so it’s customary in NYC for buyers’ agents to register their clients for open houses and send them unaccompanied. This is especially considerate when you don’t yet have an idea of which neighborhoods you like. If you’re new to New York, then by all means stop by open houses on the weekends all over the city until you get a feel for what you’re into. If a listing has an open house ‘by appointment only’ however, you’ll want to have your buyer’s agent reach out directly to the listing agent and schedule a time. Walk around the neighborhoods after the open houses to get a feel of the local vibe and whether you could see yourself living there. When you’ve gotten a better sense of which specific neighborhoods you’re into and what exactly you’re looking for, let your buyer’s agent know so he or she can start sending you some property suggestions. For example, do you need at least 3 bedrooms and 2 bathrooms? Do you need to keep it under $4,000,000? Do you need a co-op building that allows a 20% down payment or less? Do you want a doorman building or would you rather have a building with lower monthly expenses and no doorman? Do you have a dog or cat and therefore need a building that allows pets? Try to be reasonable with your demands as many criteria are not searchable on the NYC Multiple Listing Service (aka REBNY Listing Service or RLS) nor on public search websites like the New York Times, Brownstoner, Homes.com, Agorafy or StreetEasy. Try to stick with simple criteria like the ones we mentioned previously, such as price and number of bedrooms. Otherwise, if you’re intent on living in a building that allows pet tarantulas, you and your buyer’s agent will be stuck asking the listing agent of each property manually for whether tarantulas are allowed! Out of courtesy for your buyer’s agent’s time, try to view as many properties as possible at open houses where you can simply stop by. Make sure you write your buyer’s broker’s contact info on the sign in sheet so that listing agents can follow up with your buyer’s agent instead of harassing you and adding you to their newsletters. If there is no open house posted, simply send the link of the listing to your buyer’s agent who will inquire on your behalf for availability for a private showing. Pro Tip: A good sign that a listing is still available for sale is if it has an open house posted, even if it’s an open house by appointment only. Otherwise, the only way to find out if it’s still available is to ask the listing agent. A listing may actually already have an accepted offer or a contract out but not yet signed. The only listing statuses you can see publicly are available, in-contract and sold. You’ve seen the perfect co-op apartment and are ready to move forward, what comes next? Assuming you’ve signed up with an experienced buyer’s broker, he or she will guide you through the rest of the process. Your buyer’s broker will explain the NYC closing process to you and what happens between offer acceptance and closing. You’ll be surprised to learn that once your buyer’s agent gets an accepted offer for you on your perfect apartment, he or she will introduce you to a seasoned real estate attorney who will review and negotiate the contract on your behalf and take it from there. Your real estate attorney will also conduct legal and financial due diligence on your behalf which means reviewing the original offer plan, coop financial statements, board minutes and the coop lien search. Pro Tip: A typical real estate attorney in NYC will charge a flat fee of $2,000 to $3,000 for a co-op purchase transaction. This includes buyer due diligence, contract review and negotiation as well as the closing proceedings. Fees can be more or less depending on the specifics of a deal. Learn more about NYC real estate attorney fees in this article. An offer email with all of the above will be sufficient for the vast majority of co-op listing agents in NYC. However, a small minority of coop listing agents who want to be difficult may require a signed Submit Offer form in addition to the above. Your buyer’s broker will negotiate your offer with the listing broker and will let you know whether the seller has accepted your offer, or whether the seller has made a counter-offer. Sometimes you may not get a counter at all if your offer is perceived to be too low. If there are multiple competing offers, you may end up in a best and final offer situation where all bidders are asked to put their best offer forward by a certain deadline. It’s important to remember that real estate offers are not binding in New York City at all. It does not matter whether your offer was made in writing or was imply oral. Nothing is binding until a purchase contract has been signed. A transaction becomes binding for you as the buyer once you have signed a purchase contract and the seller’s attorney has received said contract. However, a deal only becomes binding for the seller as well once the seller has counter-signed the contract and returned it to the buyer’s attorney. Pro Tip: A seasoned buyer’s broker will be able to advise you to put offers in on multiple listings so you can retain optionality. In contrast, a novice buyer’s agent won’t be able to tell you that having multiple accepted offers is quite alright. Even though it’s not best practice to lead listing brokers and sellers on, it’s perfectly in your right to change your mind at any time before you actually sign a purchase contract! Are you having doubts about the competence or experience of your buyer’s agent? Is that why you’re having to read this guide and trying to figure out how to buy a coop on your own? If so, please read our article on how to get rid of your real estate agent in NYC, it’s quite easy to switch to one of our seasoned partner brokers who will also give you a substantial buyer closing credit at close. Once you have an accepted offer, the seller’s broker will circulate a deal sheet (aka transaction summary) around to the seller’s attorney, the buyer’s attorney and the buyer’ broker. The primary purpose of the deal sheet is to put the attorneys in touch with each other and to state the basic terms of the transaction, such as price, amount to be financed and any contingencies so that the seller’s lawyer can prepare a draft of the contract. If a seller’s attorney is worthwhile, he or she should have a draft contract ready to send out to the buyer’s attorney on the same day that the deal sheet is circulated. If a co-op apartment is slightly under-priced or otherwise very attractive with back-up offers, your lawyer may only have several business days to complete due diligence and get you to sign the contract. If an apartment has been on the market for many months, you may be able to get away with a lengthier contract diligence period of several weeks. However, it’s rarely in your interest as a buyer to prolong the period before signing a contract (especially if you’ve negotiated a good deal). Having a slow attorney can put you at risk of another buyer outbidding you or the seller simply changing his or her mind and deciding not to sell or renegotiating on you. Note: It’s important to hire an attorney who specializes in NYC real estate transactions. You’ll want someone who understands that the standard purchase contract template (REBNY or NYS Bar Association) is not typically marked up, and that customizations are generally included within the separate buyer’s and seller’s riders that come with the contract. Make sure to ask your buyer’s broker for recommendations to reliable local attorneys. Read our article on questions to ask your real estate attorney before you interview them! The co-op apartment’s listing agent will typically have an electronic copy of the coop’s original offering plan, building financials statements, house rules and board purchase application for your lawyer and buyer’s agent as soon as an offer is accepted. Coop board minutes can typically only be reviewed in person at the managing agent’s office after scheduling an appointment. You may want to accompany your lawyer when he goes to review the board minutes as you may pick up on some aspects of how the building is run that you may or may not like. Once your lawyer has completed his or her due diligence and negotiated the purchase contract as much as possible in your favor, you will meet to review everything before signing on the dotted line and handing over a check for the 10% contract deposit. This is a significant moment for most people as the good faith deposit is usually the biggest check they’ve ever written! Note: E-signatures are perfectly acceptable in New York and more and more contracts are being executed these days via vendors like HelloSign or DocuSign. Many attorneys find e-contracts to be far more efficient than making and messengering four paper copies of each document. If your lawyer tells you that he or she does not do e-signature, that’s a serious red flag which may suggest that your attorney isn’t familiar with technology and may be slow. After your lawyer has delivered the signed contract and contract deposit to the seller’s attorney, you will typically have to wait a day or two for a response. If the seller’s team is professional, they will quickly counter-sign and return the fully executed contract to your attorney within a business day or two. However, we have seen cases where a seller shops a buyer’s signed contract and ends up selling to another higher offer. In this sad case, it’s really too bad for the buyer! Pro Tip: A home inspection is uncommon for co-op or condo purchases in NYC, especially in buildings with greater than 10 units. Remember that co-op shareholders are only responsible for certain aspects of the interiors of their apartments. It will do no good to pay for a home inspector to view the building’s boilers and elevators when you don’t even have a right to alter them! Congratulations on getting this far! A real estate transaction is said to be “in contract” once both the buyer and seller have fully signed and executed the purchase and sale contract. As this point, both the co-op apartment buyer and seller is legally bound to the transaction with a few standard caveats. The co-op closing timeline is typically two to three months from the date of a fully executed contract. One unique out to a co-op purchase contract is board rejection. If a buyer is rejected by the co-op board due to not meeting the co-op’s financial requirements or simply because they didn’t like the buyer after meeting him or her during the coop board interview, then the buyer obviously can exit the contract with no penalty. It’s important to understand that co-op boards almost never reveal the reason for a board rejection and they are not obligated to provide any reason or grounds for rejection. It is entirely in their right to do so without disclosing any information. Note: In the rare instance that a coop board reveals that the buyer was rejected due to poor financials or not meeting the board’s financial requirements, you may be in trouble if the original REBNY Financial Statement you submitted is substantially different from your actual finances which were verified in the coop board package. If you actually lied and overstated your finances in order to get an accepted offer and subsequently got rejected by the board, you may be liable for damages if the seller decides to sue you. You should get started on the coop board package as soon as you have a fully executed contract. If you’re fairly confident that the seller won’t shop your offer and go with someone else, you can start soliciting friends and co-workers for personal and professional reference letters as soon as you have an accepted offer. Reference letters typically take the longest amount of time to collect and are out of your control, so you should get started as soon as possible. Other general tips include making sure that everything is typed and not leaving anything blank. If a question is not applicable to you, simply write “N/A” instead of leaving it blank. You should meticulously follow the instructions listed on the first page of the coop board application and provide all documentation requested. it’s very important that the financial information you input on the application is consistent throughout. For example, the annual income you fill in on the application should match the figure on your employer verification letter. Similarly, the mortgage payment you input on the application should match the estimated payment listed on your mortgage commitment letter. When it comes to completing your financial statement, is essential that you use the balances from your most recent statements (as opposed to online banking balances or screenshots). It’s generally a good idea to include a financial reconciliation which shows how you calculated each of the figures on the financial statement, such as your cash balance. The reconciliation should identify each account number and show the balance and statement date. Pro Tip: You should thoroughly read our article on how to complete a coop purchase application so you can get it right the first time. The listing broker and your buyer’s agent may also have valuable advice on how strict or lenient the coop board is. You may wish to consult your buyer’s broker after thoroughly reading the above referenced article for any additional tips or experience that he or she can provide. You should take the application very seriously and make sure there are no grammatical, spelling or other errors. You should include a table of contents and page dividers, the latter can simply consist of a blank page of a different color. You should print however many copies are required and obviously make sure they are collated. There will be a lot of paper when you’re finished, so make sure to wrap them with a rubber band or two before delivering them to the listing agent for review. You’ll need to work with your mortgage broker or bank to get a loan commitment letter and Aztec Recognition Letter, both of which will be required when you submit the coop purchase application. If you haven’t already, this is the time to submit all remaining documentation to your lender in order to get your loan underwritten. Note: Though uncommon, a buyer can instruct the buyer’s agent not to share the board package with the seller’s broker. However, if there is no “objection from the buyer” per Article II, Section 9 of the REBNY Universal Co-Brokerage Agreement (the “UCB”), then the buyer’s agent must provide the seller’s agent with a copy the board package. If the seller’s agent wishes to make absolutely sure that he or she will be able to review the board package, he or she can request the seller’s attorney to insert a provision into the contract that will require the buyer to show the board package to the seller’s agent. Remember that an incomplete application will result in more time lost as your application is returned to you by the managing agent. This back and forth can be very costly for buyers especially if they have an expiring lease on their current apartment or a rate lock on financing that will expire. The coop board interview gets a bad reputation in New York City for being overly intrusive or otherwise unpleasant. Even though the purchase contract has language mandating that you cooperate with the coop’s board which means answering their questions, very rarely will you be asked something totally off the wall such as what kind of underwear are you wearing! With that said, please make sure you read our tips on preparing for the coop board interview as well as our guide on how to ace a coop board interview in NYC. We’ll give you tested advice from industry experts across the city as well as common sense tips that you may or may not already know. Just remember, keep it short, sweet and polite! There’s no need for you to go off topic. Just answer the questions asked and don’t provide any more information than is relevant to the question asked. Often times, the board has already approved your application and thinks you are financially qualified, in which case they simply want to meet you to make sure you’re not a complete wreck in person! Warning: Please remember that this is not the time to bring up your plans for renovation. Even if you’ve already received the alteration agreement, this is not the time to try to get the board to pre-approve your renovation plans. Just imagine how presumptuous that will sound to the board when they are there to vet you to be a shareholder in the first place! You will often receive notice from the managing agent that you’ve passed and are approved to close within one or two business days after the coop board interview. If you’re lucky, you may even get an informal indication at the end of the coop board interview that you have passed! Once the coop board has approved your purchase, you’ll simply need a clear to close from your bank! Your attorney will work with the seller’s attorney and your bank to coordinate a closing date that works for all parties. Remember that a commitment letter from your lender is required for the purchase application submission, so your lender should be ready to go as soon as you have coop board approval. Note: Be careful about your rate lock expiring before you can schedule a closing. If your rate locks expires, you may have to pay a significant penalty to extend your rate lock. It may make sense to start all over with another lender if the penalty is significant. However, if market rates have become lower since you locked rates, your lender may just waive the penalty. Your buyer’s agent will schedule a final walk-through of the apartment usually the day before closing, or right before the closing on the same day. During this final walk-through, you’ll have the opportunity to inspect the apartment and make sure that the condition hasn’t substantially changed since your last visit. This means that you should check to make sure the appliances, toilets, showers, sinks, lights and electrical outlets are still in working order. You should look for any damage that may have been caused by the movers when the seller moved out their furniture. Note: Contracts will typically stipulate that appliances will be in working order; however, that does not mean the appliances need to be in any specific condition. That means you can’t demand the seller to get a new fridge because you feel that the existing one is too old. Most purchase contracts will stipulate that the condition of the apartment has not substantially changed since the signing of the contract. The only way to prove that something has changed since your last viewing is to take lots of photographs. Otherwise, because properties in New York are sold as is, there will be no way for you to prove that the new hole in the wall wasn’t always there! On closing day, you’ll typically meet at the building’s managing agent’s office or the seller’s attorney’s office. Attorneys representing the banks, the seller and the buyer will be present as well as a closing coordinator who will shepherd all parties through the closing process. The buyer and seller will also be present unless they have given a power of attorney to their lawyer to act on their behalf. The brokers are typically not present at closing and will usually pick up their commission checks at a more convenient time. This is because there is nothing for the brokers to actually do during a closing, and often times conference room tables will not have extra seating for the brokers. If a broker were to show up towards the end of the closing, it would only be to congratulate their client and to pick up their commission check! Pro Tip: If you’ve signed up for a discreet home buyer commission rebate through one of Hauseit’s partner brokers, then you will also be receiving a check for $20,000 or more after closing! Our partner brokers may show up towards the end of closing and hand you your gift in a discreet envelope directly, after the closing is finished. Alternatively, once they have cashed their commission check and the proceeds have cleared, they will mail you a check from their bank directly. Either way, commission rebates are not taxable as income and are viewed as a concession on price according to the IRS!